If you’re craving the freedom that camping brings, don’t forsake any of life’s luxuries – go glamping in Wales instead. 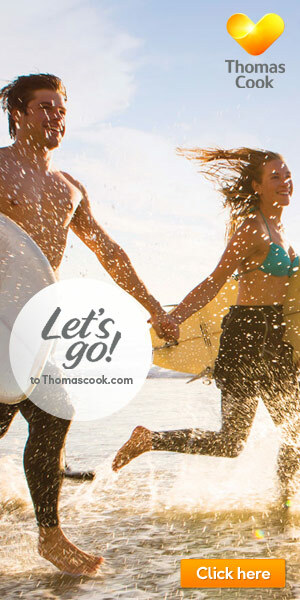 Trust us, it’s incredible and should feature highly on everyone’s bucket list. A form of camping involving accommodation and facilities more luxurious than those associated with traditional camping: glamping is likely to satisfy any city slicker seeking a little refuge in nature—without foregoing any of life’s luxuries. So, why do we love glamping so much? Well, there’s a ton of benefits. Firstly, you get to camp out, sleep under the stars and have a little adventure. But (and it’s a big but) you don’t have to rough it. You’ll be able to enjoy the back-to-nature vibe, without having to sacrifice your comfy bed or your beloved kettle. Most glamping sites can be found on farms. So you can spend days lazily wandering through their grounds, feeding the odd pig and watching lambs frolic (if you choose your season wisely). Glamping sites also tend to have on-site farm shops, which provide organic, wholesome, fresh food. When eaten outside, overlooking scenes of natural beauty, the food tastes sublime. It’s the kind of alfresco culinary experience that can’t be beaten. So, what’s the downside to glamping? Honestly, we’d struggle to find any negatives. Unlike camping you don’t spend the morning rubbing your sore back, and you don’t spend an inordinate amount of time preparing the most basic of meals. There’s no tense moment when you can’t find the mallet to bang in the tent pegs, and when the holiday is over you’re not going to have to try and squeeze your suddenly gargantuan tent into its miniscule, impossibly small, tent bag. Overall, we have to say that glamping is one of the greatest holiday breaks you can have in Wales. Give it a go. 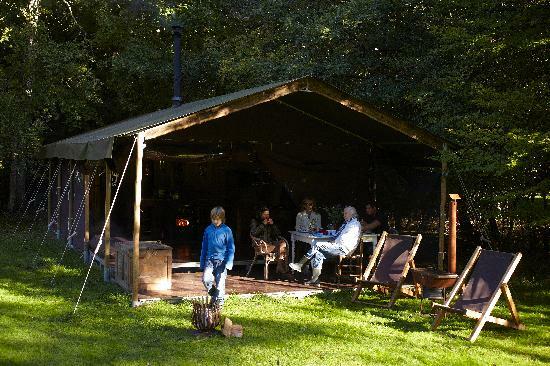 First up is glamping on Pant yr Hwch Farm, in Lampeter, Wales (Llanwnnen, Lampeter, Wales SA48 7LY). 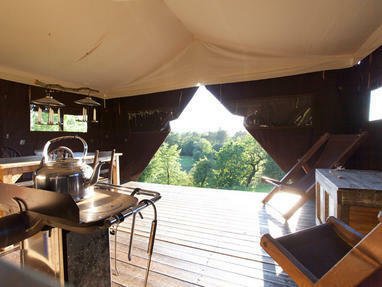 Glamping Accommodation: The safari tents at Pant yr Hwch Farm are state of the art. Each luxury tent comes equipped with their own kitchen, master bedroom, bunk bedroom and ‘cupboard bed’ area. There’s also a dining area and washrooms, which you’ll be pleased to hear comes complete with a flushing toilet. Once the sun sets, you’ll love snuggling up in front of your tent’s woodburning stove, which sits at the heart of the tent’s main living space. It really is the perfect way to relax. Glamping Activities: There’s never a dull moment on Pant yr Hwch Farm. The farm is situated in a beautiful location, and sits atop of a hill overlooking a valley. The farm is surrounded by woods, which are perfect for exploring, and you can try out tending orchards. Once you’ve wandered around the gorgeous surrounds, go on a nature hunt – there’s red kites nesting nearby (red kites are the official bird of Wales), and if you’re very lucky you might even spot a badger. On the farm, you’ll be able to watch the badger face sheep, the woolly pigs, plus there’s chickens, bees and ducks to keep you entertained. If you’ve gone on holiday with your children, we recommend hiring one of the farm chickens for your break. They’ll love taking care of it, and collecting the eggs each day is the highlight of the week for lots of little ones. After exploring, head to Conti’s Café for a homemade icecream, or why not buy some of the farm’s home-grown produce and have a relaxed meal at the site? The farm sells the perfect holiday fayre, from Elderflower champagne, meats and cheeses, to sourdough bread, lavender cookies and some impeccably good chocolate cakes. For days out, you won’t need to go far. The Ceredigion Heritage Coast, the Pembrokeshire Coast National Park, and Brecon beacons National Park encircle the farm, and are special places that will provide the perfect backdrop for you and your family to make some wonderful memories. Book your family glamping holiday at Pant yr Hwch Farm. Now we’ll take a look at Glanmor Isaf in Bangor – a farm that specialises in sheep and beef. Glamping accommodation: Glanmor Isaf Farm provides the perfect setting for a glamping holiday. Not only is the farm spectacular, it is also situated between the coast of north Wales and the beautiful Snowdonia Mountains – you’ll never be short of a fantastic view. Plus, the lively city of Bangor is also just 10 minutes away. The farm’s safari tents are also ultra-comfortable. In addition to the expected amenities, you’ll find wonderful extras, such as a coffee grinder, solar heated showers and a pizza oven. Activities: You could spend all day lounging with a good book at Glanmor Isaf Farm, drinking fresh coffee and soaking up the beautiful surroundings. But if you prefer a more fast-paced holiday, you could hire one of the farm’s bikes and explore the North Wales Cycle Track. Or, pull on your walking boots and take a stroll along the north Wales coastal path. For the more adventurous soul, there’s also powerboating, dinghy sailing, cruising, kayaking, and windsurfing at the Plas Menai Centre. Book your family glamping holiday at Glanmor Isaf Farm.